To take us away in the names of God and "righteousness"
While they chant, "This isn't happening..."
"It can't happen in America"
"All men (and women) are created equal..."
...Crown thy good with brotherhood, from sea to shining sea..."
It CAN happen, and IS happening, here!! Do you "get it" yet? "Get me a war on in the morning. Ding dong! My polls are gonna shine. Federal taxes down, state taxes up. No impeachment today? I must be okay! Just get me to the war on time! God Bless Big Business and the Oil companies. Unemployment and gas prices are arising. I''m bankrupting the nation; maybe I need another month's vacation? No, just get me to the war on time! I had no agenda before 9/11--I may not even get to go to Heaven. 60 Minutes has Clinton & Dole, but I have Colin Powell's soul! World War Three might start just because of me! So, remain quiet and just get me to the war on time! I'm Enroning the national budget in the morning. You may have more brains, but I''ve got all the planes. If I can find an "enemy", then I don''t have to work. We''ll all be mourning in the morning! School districts are floundering, deficit spending is astounding. Education, health and social security aren't the issue. We''ve got a bigger one with W--A--R! I'm exceeding Hitler's and the Roman Empire's military budgets. So, get me to my war on time! I've got Limbaugh and corporate TV. No other thoughts are gonna count! My wife is afraid of poets, but I've got all the bullets. I'm not a moron. Let me get my war on. Don't try me for treason--I have my reason. Don't get mad--I'm doing this for Dad! So, just get me to the war on time!" "Only a cowardly escape from the problems of peace"
With gratefulness to Martin Luther King, Jr. 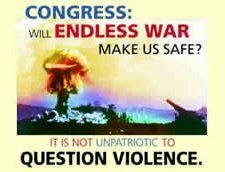 In LONGING for only "malice, hate and violence"
Carrying out the business of the world "CASINO"
IS not this what we should be seeking over war? PEOPLE who will then be at Peace with everyone? desde las torres de Cordoba. "!Ay que camino tan largo! antes de llegar a Cordoba! I shall never reach Cordoba. "Oh, such a long way to go! And, oh, my spirited pony! The way the hammer shapes the hand...."
As well as to today with "Bush-the-Monstrous"
When the world's full of phony PEOPLE? And the speechless speak the (T)ruth"
And what ever happened to peace on earth? Is this what God wants us to do? And whatever happened to peace on earth?" Lusting after death and destruction? Coming to learn about war versus peace? For our complicity in the endless slaughter? That mercy which glorifies humankind? As they themselves condemned the weak and innocent? Where lay our true days of independence?